The Ring Video Doorbell Pro is one of the best all-around smart doorbell cameras you can buy as long as you’re willing to hardwire it. The Video Doorbell 2 is Ring’s core model, offering a smart doorbell camera that can be hardwired or battery-powered — but if you're set on using doorbell wiring, then you should consider bumping up to the Ring Video Doorbell Pro instead. By and large, they have the same feature set and core functionality, but the Ring Video Doorbell Pro does it with a much slimmer and sleeker profile, with a size that's much more likely to fit on your doorframe where the current wiring sits. And it does offer one big bonus perk in the form of truly customizable motion detection zones, letting you carve out the portion of your yard or property that you want its digital eye focused on. We tested the Ring Video Doorbell Pro for a full week, putting the device through its paces as we answered doorbell buzzes, scoped out motion alerts, and contemplated how it stacks up against other leading smart doorbell cameras on the market today. It might not be easy to tell from photos, but put them side-by-side and the size difference between the Ring Video Doorbell Pro and Ring Video Doorbell 2 is immediately obvious: the Pro is much, much smaller and slimmer. At 4.50 x 1.85 x 0.80 inches, the Pro is 0.65 inches narrower across than the Ring Video Doorbell 2, which can make a world of difference when attempting to mount it on your doorframe. Beyond the trimmed bulk, the Ring Video Doorbell Pro also has a more sophisticated allure. The button here is even more prominent, standing out from the black surface and surrounded by a glowing white ring (that rapidly rotates and turns blue when pressed), with the camera in view immediately above. It also comes with more faceplate options, with Satin Black, Satin Nickel, Dark Bronze, and Satin White shells included. The Ring Video Doorbell Pro has a sophisticated allure. The Ring Video Doorbell Pro must be hardwired to your existing doorbell wiring. If you feel confident handling electrical wires and you know that your transformer is powerful enough (16-24 VAC) to handle it, then you might be able to install it yourself. Just remember to shut off the power before doing so. On the other hand, if you don't feel comfortable fiddling with electric wires of any kind, then you will want to enlist the help of an electrician or professional installer. You will probably want an electrician to help with any modifications to your current doorbell setup, including installing a more powerful transistor or mounting the included Pro Power Kit attachment to your chime box. In our case, we hired a licensed electrician to complete the physical installation process. The Ring Video Doorbell Pro comes with multiple angled installation mounts, in case you need to install the doorbell at a downward or upward angle, or with a tilted side. In our case, we used the side-angled mount to account for a small lip on the storm door frame, with the end result being nearly flat once installed. From there, the setup process within the Ring app is very straightforward. You'll create an account, plug in your home Wi-Fi information, and then give it a couple of minutes to complete. It was smooth sailing on our end. We've had a great experience with the Ring Video Doorbell Pro, which impressed us with reliable and precise motion detection and strong video quality. The Ring Video Doorbell Pro consistently scans the image in view and sends an alert to your phone when it detects movement. Live on a busy street? If so, you might get more alerts than you'd want or need — but that can be tweaked with ease. The Pro's custom motion zones feature lets you choose the exact dimensions of your walk-up that you want alerts for. It's as easy as dragging and dropping points on the screen to create a map of your yard or property, excluding the street or even sidewalk if you please. It did wonders to cut down on unnecessary notifications on our end, and only registered the rare occasional false alert (say, from a passing truck) thereafter. The Ring Video Doorbell Pro is one of the most stylish smart doorbell cameras on the market, with a svelte and alluring design that's small enough to fit on most door frames. When someone presses the button, you'll rapidly get an alert and be able to patch into a two-way call, in which you can both see and hear the person in front of your door and he or she can hear you. This makes it easy to dismiss an unwanted visitor or tell them to hold on a moment, or you can simply scan the image and choose not to engage — that's your call to make. The Ring Video Doorbell Pro itself makes a modest chime noise when the button is pressed, but you may not hear it from further spots in your home. If you want more than just the alert on your phone, you can also buy a Ring Chime accessory, which plugs into any wall outlet in your home and plays an audible chime. Additionally, you can connect your Ring account to Amazon's Alexa and get a vocal heads-up from your Echo when the button is pressed. You can also view the live video feed from an Amazon Echo Spot or Echo Show, plus Ring devices work with IFTTT (if this, then that) applets, opening up further smart device compatibility and other helpful features. The Ring Video Doorbell Pro records 1080p footage with a 160-degree field of view, capturing crisp and colorful footage and putting it in the cloud for you to view at any time. You can zoom into video, as well, although the image will only get blurrier when you do so. In the evening, the doorbell automatically engages a night vision mode that makes it much easier to make out faces in low-light scenarios. The Ring smartphone app for iOS and Android is a slick, well-designed experience that allows you to easily manage your Ring Video Doorbell Pro. You can also manage any other Ring doorbells or cameras at your home. It's here that you can view a live feed, loop back on any missed movement alerts or doorbell presses, and tweak the custom motion zones and other settings. However, the downside of Ring's well-built app is the existence of the Ring Protect subscription service, which is required for viewing, sharing, and saving any recorded videos after your 30-day trial period. Without it, you can only view motion detection and doorbell press events when they happen, not after the fact. It's $3 per month (or $10 for multiple devices), so keep that in mind when considering your total investment. The Ring smartphone app for iOS and Android is a slick, well-designed experience that allows you to easily manage your Ring Video Doorbell Pro. At $249, the Ring Video Doorbell Pro is pricier than some other smart doorbell cameras on the market, including Ring's own Video Doorbell 2 ($199), the Nest Hello ($229), and the RCA Doorbell ($149). The added investment is worth it for the sleek and stylish design, strong performance and app experience, and ability to intricately tweak your motion detection zones. As mentioned above, however, note that an ongoing subscription is necessary to unlock some key features of the Ring Video Doorbell Pro. Nest also has a paid subscription service to access similar features for its doorbell, while the RCA doorbell does not have any ongoing costs. The biggest differences between the Ring Video Doorbell Pro and the RCA Video Doorbell come in the realms of price and style. There's a $100 gulf between them right off the bat, but you're getting a more polished and alluring design with the Ring Video Doorbell Pro. It's modern and enticing, while the RCA doorbell just looks like a hunk of plastic. Functionally, however, they're very close. Both have reliable motion trackers and record clear video, with the RCA's optional Ultra HD setting showing more clarity when you zoom in. However, the Ring Video Doorbell Pro's custom zones are much smarter than the basic options with the RCA Video Doorbell, the Ring app experience is much cleaner and easier to understand, and Ring's devices have extended smart home hooks that RCA lacks. 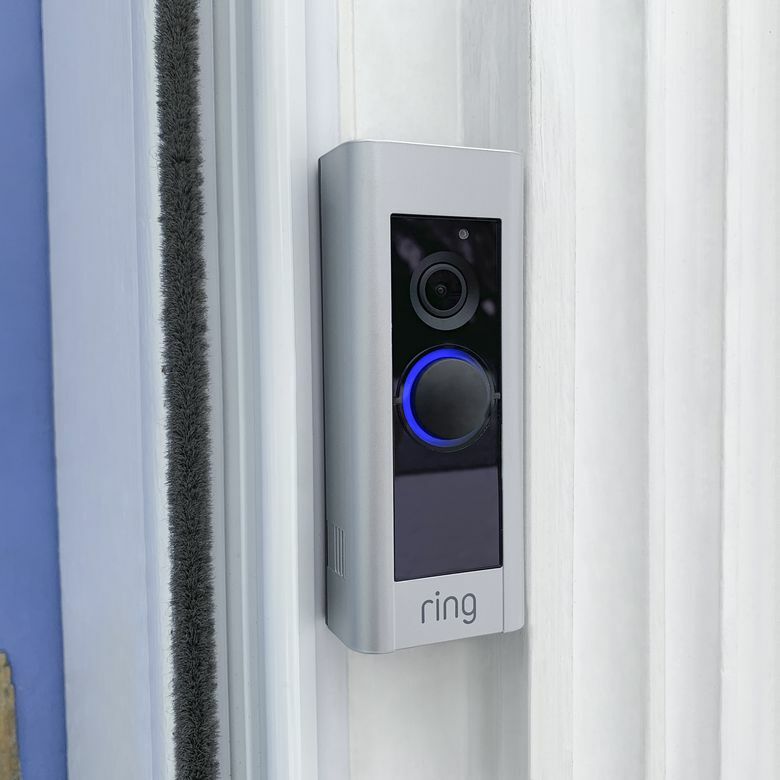 The RCA is a good, straightforward entry-level option, but the Ring Video Doorbell Pro adds more polish and functionality for the added expense—and the monthly subscription fee, as well. Want to take a look at some other doorbells to consider? See our guide to the best smart doorbells to buy today. If you already have doorbell wiring on your home, then the Ring Video Doorbell Pro is an excellent smart doorbell camera option. It's a feature-rich device that works very well in everyday usage, tracking movement and letting you jump into remote two-way conversations with anyone who presses the doorbell buzzer. Product Dimensions 4.5 x 1.85 x 0.8 in.